WARNING: This item contains small parts.Please keep it away from young children. Is losing keys a major issue? 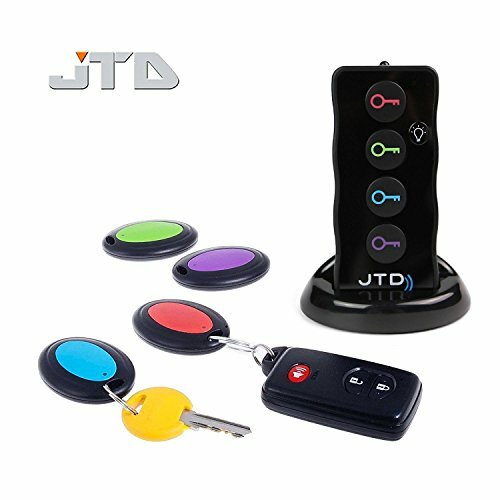 JTD ® provides this latest version key finder to solve your problem. This remote key finder(key tracker) can help you to find the lost keys, remotes, purses, glasses, canes, and other easily lost novelties quickly. With just one press on the color-coded button, the beep sound and flashes will lead you to find the lost stuff. This is a unique remote key finder with LED flashlight and holder support. The ON/OFF switch is located at the right side of the transmitter, which allows you to turn on and off the LED flashlight easily. This becomes extremely handy when you need to find something in the dark. The key finder with base support is also a good decoration for your tea table, TV bench, bed, computer desk, bookshelf, etc. The remote control transmitter is removable from the holder and can be carried by you to find lost stuff. · 1 RF transmitter with 4 brightly colored buttons. Includes 4 receivers, one transmitter and key rings with a 75-130 feet range. Low consumption and long standby time with stable frequency technique.Wireless search that easily penetrates though walls, cushions and doors with a push of a button. WARNING: This item contains small parts. Please keep it away from young children. Other Tips: Rotate battery cover to ''ON" position to remove the cover, and rotate to "OFF" position to latch the cover. If you have any questions about this product by JTD, contact us by completing and submitting the form below. If you are looking for a specif part number, please include it with your message.